The art of On Kawara. When a person of note has passed from this world, we are often asked to observe a moment of silence. There’s a double sense to the verb. We are asked not only to add our silence to the silence being kept by others, but also to recognize the moment of silence, to focus our attention on it. The exhibition of the revered conceptual artist On Kawara, at the Solomon R. Guggenheim Museum in New York through May 3, is titled “Silence,” and there’s a hint of the imperative in it. Kawara, who was born in Japan and settled in New York in 1964, died last July at the age of 81, and so the planned retrospective, “organized in close collaboration with the artist,” as we are assured, has turned into the moment of silence we should observe in his honor. But in Kawara’s art, the act of observing always cut two ways—following rules and conventions, albeit strictly ones he set himself, and then making sense of the consequences. Kawara guarded his silence. He was one of those rare artists who never publicly commented on his work—no interviews, no manifestos, no statements. Yet a good deal is known about how and why he made art. One of his works is called I Met, and it consists of twenty-four big loose-leaf binders containing typed lists, slipped into plastic sleeves, of everyone he met each day from 1968 through 1979. He met a lot of people. On February 15, 1971, for instance, he met Hiroko Hiraoka, Konrad Fischer, Daniel Buren, Jan Dibbets, Ian Wilson, Bruce Nauman, Robert Ryman, Hanne Darboven, Sol LeWitt, Lawrence Weiner, Robert Barry, Richard Long, Mario Merz, Keiko Narahara and Ikko Narahara. This list is a roll call of some of the most prominent younger artists of the era. What was going on that day? An important opening, perhaps? Other days feature less stellar dramatis personae. But the variations between lists makes you wonder what it meant for Kawara to have met someone: Is the grocer’s name listed, the plumber’s, all the people who cross one’s path from day to day without their personal identities making much of an impression? Apparently so, but it can’t always be possible to know each person’s name. Will the list always be incomplete? Or can it become too complete? The most recurrent name is that of Hiroko Hiraoka, Kawara’s wife—but doesn’t it seems odd to speak of “meeting” the person you live with? In the show’s excellent catalog, Anne Wheeler (who organized “Silence” with the Guggenheim’s senior curator Jeffrey Weiss) offers an anecdotal explanation of how I Met came to be. Kawara was an inveterate traveler. “His peregrinations brought him into constant contact with new people, and he at times had difficulty remembering unfamiliar Western names. As a result, he often asked people to give him their business cards or write down their names to help him memorize them,” Wheeler writes. “One day, struck by a name of Hispanic origin as written on a business card, he recalled a challenge posed to him by his friend Kasper König: write a poem that could be understood anywhere in the world. The name seemed to him a kind of readymade poem, comprehensible anywhere, and with König’s proposition in mind, he realized that the international language he’d been seeking could be found in names.” It’s a beautiful story—more so than the work it purports to explain. So much can be told about Kawara’s intentions, despite his ostensible silence. Like Socrates, he did not write—but he must have liked to talk, and what he said was valued and shared. I Met may seem like a readymade, but in one sense it is not. To make it took a lot of dogged work—just a little bit every day, but over twelve years, it all adds up. Yet what it does have in common with Marcel -Duchamp’s snow shovel and bicycle wheel is its ordinariness, which the artist has managed to surround with a discursive penumbra that invites interpretation. One could well imagine someone else compiling a comparable list of names and it simply being a symptom of an obsessive-compulsive disorder. But to see it as a long, universally comprehensible poem, a sort of stripped-down modern epic, opens other doors in the mind. It could well be objected that the work itself—that shelf-full of dull-looking binders—could never evoke such a vision, and that to imagine otherwise is to let oneself be beguiled by the currents of palaver floating around it. True enough, but there’s an art to conjuring such spells, and I’m not sure it should be dismissed out of hand. Each painting is housed in (or, in the case of the larger paintings, merely accompanied by) a cardboard box that also contains a clipping from that day’s newspaper. At the Guggenheim, the boxes and clippings are mostly displayed in vitrines beneath the corresponding paintings. The selections are unpredictable. Beneath a painting from New Year’s Day, 1970, is the front page of The New York Times, with items on, for instance, the inauguration of John Lindsay for his second term as mayor and a dispute between the city and the transit workers’ union, which had turned down the offer of a 12 percent wage increase (how times have changed). The next day, January 2, Kawara chose a page of movie ads; on the 3rd, the TV listings, and on January 4, a profile of Lord Snowdon, the celebrity photographer who was then married to Princess Margaret. A painting of the date of its making—the form of the tautology is familiar enough: Robert Morris had produced his Box With the Sound of Its Own Making in 1961, and similar kinds of self-referential gambits were everywhere in the art of the 1960s and ’70s. With Kawara, as in most such cases, the work cannot really guarantee its promise: How do we know the sounds emanating from the tape recorder inside the box are really the sounds of its own making? How do we know that the date on the front of the painting is really the date on which it was made? Ultimately it is the artist, not the work itself, who stands as guarantor; we just have to take his word for it. We are told—but as usual, not directly by Kawara himself—that if he failed to complete a painting on the day he started it, he would destroy it. Another artist might have made a different rule for himself—to declare the painting finished at the end of the day whether it was complete or not, for instance. This would have conveyed a different sense of time than “Today” does at the Guggenheim. The paintings are beautifully crafted—“produced though multiple stages of applying ground and color surface as well as the laying in of the inscription, with minute adjustments for the composition of letters, numbers, and punctuation,” as Wheeler explains. Their very perfection as surfaces—as seamless in their own way as the “licked surfaces” of nineteenth-century academic painting—lends them an “all at once” appearance, a snapshotlike immediacy that belies the fact that they would have taken hours to complete. In that sense, they are illusionistic: they appear to embody a moment, even though many moments were needed to make them. Exhibiting some of them in an unfinished state would have shown time in a different manner—the slow time of making, which is different from the moment of perception. In any case, the impression made by a large array of date paintings produced over the course of nearly fifty years—I counted more than 150 of them at the Guggenheim—is one of relentless consistency. I thought of Donald Judd’s praise, in his essay “Specific Objects,” published in 1965, of an art that would embody an order that “is not rationalistic and underlying but is simply order, like that of continuity, one thing after another.” Kawara answers Judd’s call with a vengeance, offering a sense of time that takes no notice of change, of growth and decay, learning and forgetting, gain and loss, hope and fear, but simply one day after another, each equal, each nothing more than a date on a calendar. But what about the newspaper clippings that accompany each painting, and should presumably lend historical content to the empty recitation of date after date? To my mind, the selections reiterate only the “one thing after another” of the paintings themselves. Labor troubles, the latest in entertainment, the English royal family—it all seems the very stuff of randomness, without consequence, without development. I guess I’m not sufficiently post-humanist: it leaves me in low spirits. That’s not the effect Kawara’s date paintings have on me singly, or in small numbers. I’ve seen lots of them before, but never many at once, and always found them beautiful. Seeing one or a few at a time, the sameness of them is hardly an irritant; you encounter each date as a singularity referring to a span of time whose contents would be particular to each person. They are monuments to a day, at once universal (the whole world was there that day) and different for everyone. I remember thinking—excuse me if I sound sentimental—how nice it would be to have Kawara’s painting of the date on which I got married, if he made one that day. It would have that special meaning for my wife and me that would not interfere with the significance or insignificance of the date for anyone else. But to think of it as simply one day among hundreds of others in a show, none significantly distinct from the others, is sad. Even aside from what’s in the newspaper clippings packaged with them, Kawara’s “Today” paintings do, subtly, communicate more than the date of their production. A date is noted in a language, and while most of those on view at the Guggenheim show the date in English, there are some exceptions: 4 août 2006 in French, 21 Juni 2007 in German. Each work is dated in the language of the country where it was made, just as the newspaper clipping in its box is from a local newspaper of that place; time is not entirely disentangled from space. Kawara’s travels provide the material for much of his work. I Went, 1968–79, like I Met, is a set of twenty-four ring binders, containing not lists of names but photocopied maps where the artist’s movements are traced in red marker. It’s a piece for Kawara fanatics only, I think. 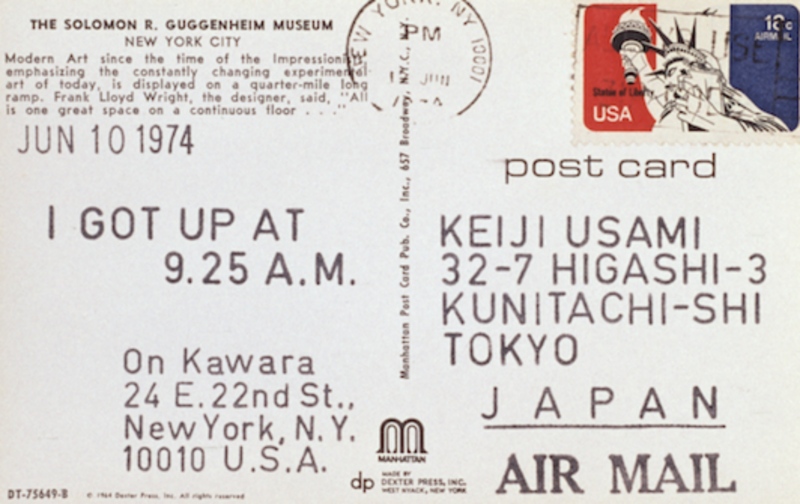 More engaging is I Got Up, 1968–79, a project that involved sending picture postcards to various people, each rubber-stamped with the words “I got up at” followed by the time of day, and then the artist’s name and the address from which the card was mailed. As with the date paintings, it is possible to imagine that the work’s effect is different for the museumgoer, who sees the cards in great quantity, than it would have been for the addressees receiving them one by one, day by day; presumably one felt happily “chosen” to be a receiver of this communication. As every postcard has two sides, I Got Up is a work with two distinct aspects: the picture side that, at least here in their serried ranks, takes on a quasi-Pop aspect, and the more conventionally conceptual “information” side. Postcards from Mexico might show a bullfight; Munich can be represented by the Alte Pinakothek; New York is the Empire State Building, the Statue of Liberty or, for that matter, the Guggenheim Museum. The poignancy of the disappearing truth of sense-certainty becomes explicit in Kawara’s I Am Still Alive, 1970–2000, composed of the 900-odd telegrams he sent to various recipients reassuring them of his continued existence. It would always have been clear that by the time any one of these missives had been delivered, it might no longer have been true; a man can lose his life from one minute to the next. And since Kawara sent the telegrams irregularly, someone who had been receiving them for a while and then no longer did might well have wondered whether Kawara had died. But it was the medium of telegraphy that passed from the scene before Kawara himself did. And yet today at the Guggenheim we time after time read the message, i am still alive / on kawara, knowing it is no longer true. It’s a peculiar paradox: Kawara is one of the quintessential conceptual artists, but his art is without concepts. Focusing only on the abstract and empty categories of the here and the now in what his fellow artist Daniel Buren calls “a quest (doubtless impossible?) for the present,” Kawara never ventures any statement, any judgment, any proposition—except for ones that can only ever have been rendered untrue by their own form, and only seem to indicate what Hegel states: “It is just not possible for us ever to say, or to express in words, a sensuous being that we mean.” But is this impossibility, therefore, what Kawara means? The enigmatic nature of his intention emerges perfectly in Buren’s observation, in which the definitive certainty of “doubtless” is canceled out by the posited uncertainty of the question mark. If conceptual art doesn’t require concepts, what makes it conceptual? Thierry de Duve has plausibly defined it as as a form of “generic art, that is, art that has severed its ties with the specific crafts and traditions of either painting or sculpture,” an art sans métier. By this definition, I Am Still Alive is perfectly conceptual art. Pure gesture, it announced the artist’s existence through the absolute removal of his presence or that of any physical trace of his having existed. “On no occasion did his hand touch the document itself prior to its delivery,” as Wheeler says. “The appearance of each telegram varied according to where it was received, not where it was sent…. The date and time indicated on the telegrams are likewise out of sync with the date and time Kawara sent the message, as the time stamped on the telegram is that of its delivery.” It only would have been more perfectly conceptual, more absolutely removed from the notion of the artist as a maker of things, if someone else had sent the telegram. And yet the “Today” paintings are the work of a craftsman. Perhaps not the craft of the Western painting tradition, but still a craft. Call it the craft of a sign painter. Even so, the investment in that craft is unmistakable, and it’s far from casual—echoed in the recourse to laborious reiteration for its own sake that is also recurrent in Kawara’s oeuvre and that makes it so brandable.. Such repetition, which is typical of conceptual art, may represent a sort of compensation for its own lack of substantive concepts, as well as a sign of its secret alliance with the artisanal. If sign painting could be practiced at a transcendent level, it would look something like this. Most of the best conceptual artists rely, at least some of the time, on something like a craft or métier, however distant from that of traditional painting or sculpture. Lawrence Weiner is a great graphic designer—though perhaps not in the same way a professional graphic designer would excel at his job—just as Joseph Kosuth is a great exhibition designer. Gordon Matta-Clark never quite stopped being an architect. And if not for that, they wouldn’t be great conceptual artists. That doesn’t mean they practice design or architecture as art, any more than sign painting in itself became an art for Kawara. But their art manifests itself through these occupations in ways that are not easily grasped—and what they’ve had to say about the matter doesn’t shed much light. Maybe Kawara’s silence was wise after all.